One thing recorded history tells us, is that the towns’ people wanted to make sure that their children were given a good education so that one day they would make their mark on the world. This building began its humble beginnings in 1914 as a school house to educate the youth of Glen Carbon and continues to educate visitors on Glen Carbon’s rich history today. In its past, it has served as a School, WWII Scrap Metal collection center, Blood Bank, Civil Defense Building, Village Administration offices, Police Station, Doctor’s offices, Teen Town, the Reading Room and then Library, with a small museum in one room. On August 25, 2014 the building was placed on the National Register of Historic Places by the U. S. Parks Service/Department of the Interior in Washington D.C., making this building the first of its kind in the Village of Glen Carbon. The Glen Carbon Heritage Museum that currently resides in this vintage school house is pleased to share this building with you, complete with the original hard wood floors and tin ceilings that made this fine building a legacy to the community. The Village of Glen Carbon is honored that the building can continue to serve residents and visitors for years to come. 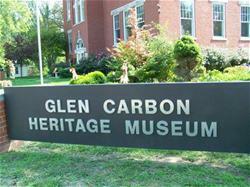 Glen Carbon t-shirts are available for purchase at the Museum or at Historic Commission events. The shirts sell for $10.00 and come in adult sizes. This years color is a heather green with green lettering. 148 Main Street, "Old Town"
Hours: Summers hours will begin in April. Eventually the Village of Glen Carbon bought the lot with the existing house which had been built around the cabin. Upon discovering the cabin lying beneath a more modern home, renovation work began in 1989 and was concluded just in time for the Village’s Centennial Celebration in June 1992. The cabin now serves as both a satellite addition to our museum and as a reminder of the past, even before Glen Carbon came into being.